MINT Snowboarding was founded in 2006. That’s twelve years of teaching, training, shredding, adventuring and making snowboard dreams come true. But where did MINT Snowboarding come from? 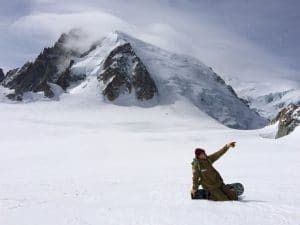 In 2006, for the first time ever, and after years of protest, 15 BASI (British Association of Snowboard Instructors) snowboard instructors gained the right to teach snowboarding in France (previously illegal!). These lucky few were given the elusive Carte Professionnelle and Tammy Esten was one of them (1 of only 3 females). 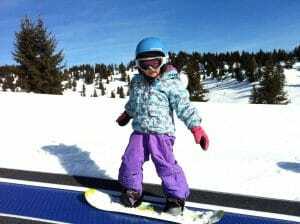 Already qualified to the highest international level she was finally allowed to teach snowboarding in France. 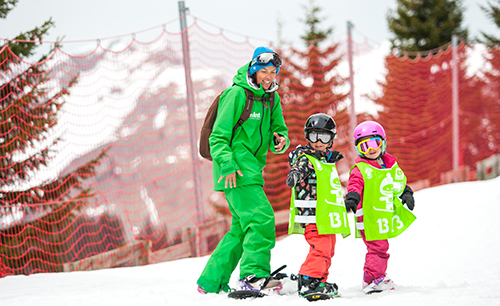 2006 | MINT was born – what do you mean you don’t teach skiing? With her Carte Pro still hot off the press Tammy set up MINT Snowboarding. The goal? To create a snowboard school, providing the best possible snowboard instruction for all levels, and delivered by skilled & passionate snowboard instructors. MINT became the first and only school in the whole of the Portes du Soleil dedicated solely to teaching snowboarding, a fact that some still find somewhat confusing! 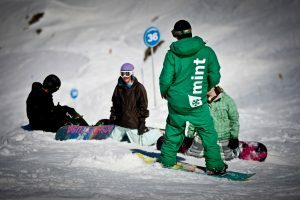 In 2007 MINT Snowboarding started running week-long snowboard camps, initially female specific and called Just 4 Girls. The program of snowboard camp offerings has expanded greatly since; with clients regularly returning year on year to take part in these uber fun weeks. Every good brand needs a great mascot. MINT has MINTy. Once known for his fearless backcountry lines, MINTy is now head of all things mini-shred! In 2016 MINTy even freshened up his image to fit this new role. In 2008 MINT started saving innocent 3-7 years olds from a winter nightmare of making pizza shapes on skis. 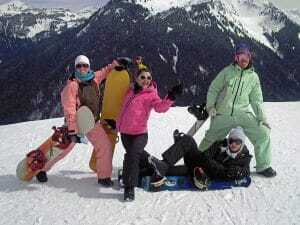 Instead they offered them specialised snowboard lessons and so the wonder that is Mini- Shred was born. In 2009 Tammy became an ambassador for the most successful girls-only snowboard brand, Roxy. From 2011 Tammy & Mint began running the Roxy snowboard camps. As Morzine -Avoriaz’s reputation as an international snowboard destination exploded so did the influx of snowboarding seasonnaires. Realizing this pool of talent had poor finances Mint started running local coaching programs and affordable seasonnaire freestyle lessons because… well because the locals are worth it! 2011 | The Helgason brothers compete in The MINT Mountain Invitational! International superstar riders Halldor and Eiki Helgason, Aimee Fuller and Jake Olson-Elm all signed up for The MINT Mountain Invitational a totally original snowboard competition run by MINT Snowboarding. Mint teamed up with Peak Leaders to offer the first, and still only, BASI snowboard instructor-training program in Morzine. Mint Snowboarding has successfully trained and inspired dozens of new instructors, achieving fantastic pass rates through their BASI exams. 2014 | Mini-Shred went GLOBAL ! Now many years into developing teaching methods for 3-7 years old, MINT and Burton decided to collaborate on a short video. The aim was to educate the world on mini-shred snowboarding and to dispel any remaining myths about teaching young kids to snowboard. These goals were undoubtedly achieved as ‘The Mini-Shred Movement’ went VIRAL! And Mini-Shred GOT BIG! Always committed to providing the highest quality snowboard instruction and service to our clients, it was great reward to hit the top of the list of ‘Things to Do’ in Morzine on TripAdvisor. MINT Snowboarding has held onto this top ranking as the number 1 of 42 things to do in Morzine every since as well as gaining a yearly TripAdvisor ‘Certificate of Excellence’. ? In winter 14/15 MINT met young Donald, a 73 year old grandfather with a passion to learn to snowboard. ‘Pensioners on snowboards?’ the world cried out in disbelief and shock. ‘Hell Yeah!’ MINT shouted as they slid by with Donald, shredding through yet another snowboard misconception. In 2015 MINT made further steps towards contributing to the future of snowboarding, this time focusing on kids living in Morzine and the surrounding area. Thus far local kids had nowhere to train. MINT solved this by creating the Local Kids Program, with 18 kids under 7 yrs on the inaugural snowboard camp in April 2015. The Kids Snowboard Club has gone from strength to strength ever since. In 2015 one of Mint’s longest standing instructors, David Gladwin, qualified as a UIAGM Mountain Guide making him one of a handful in the world holding these dual qualifications. Mint’s off-piste and backcountry offers are now off the radar with more big mountain snowboard adventures than you can shake a selfie-stick at. From zero to hero… 10 years on from being the new kids on the block, MINT Snowboarding was awarded the title of ‘Best Snowsports School 2016’ at the World Snow Awards. 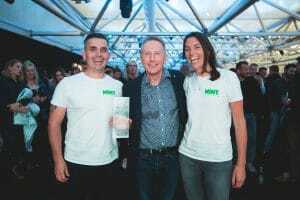 These prestigious awards honour the very best in the world of skiing and snowboarding, recognising the best brands, retailers, resorts, operators, venues and personalities in the industry. As snow sports are expensive and not necessarily open to everyone we decided we wanted to support the awesome work which the charity Snowcamp carry out. Snowcamp offer real opportunities for young people to experience snow sports and to make real changes to their life. In 2017 MINT Snowboarding made a charitable financial contribution to help get these kids on snow. 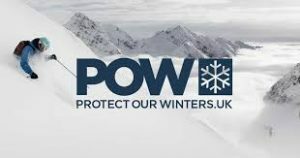 As passionate supporters of the incredible natural world, MINT Snowboarding partnered up with Protect Our Winters to actively create action against climate change. 2017 | AND STILL THE BEST! Overjoyed, and maybe a little overwhelmed, is the only way to describe the emotions of the team after it was announced that MINT Snowboarding was crowned ‘Best Snowsports School’ for the second year running. Another fantastic reward for the teams enormous efforts to make our clients snowboarding dreams come true! A champagne reception was duly enjoyed at the Telegraph Ski & Snowboard Show in London. 2017 | Mini-Shred Hits Global Again! After the success of The Mini-Shred Movement in 2014, Burton USA requested Tammy to head up a sequel video. This time with the aim of showcasing the all-out-fun that kids have snowboarding, right from the word go! This edit came out cuter than ever and was another viral Facebook hit!